Reading and share top 3 famous quotes and sayings about Someone Insulting You by famous authors and people. Browse top 3 famous quotes and sayings about Someone Insulting You by most favorite authors. 1. 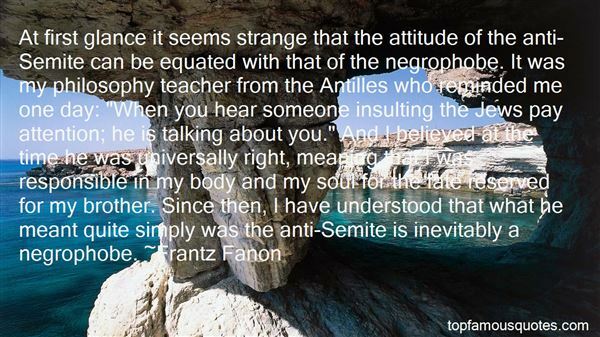 "At first glance it seems strange that the attitude of the anti-Semite can be equated with that of the negrophobe. It was my philosophy teacher from the Antilles who reminded me one day: "When you hear someone insulting the Jews pay attention; he is talking about you." And I believed at the time he was universally right, meaning that I was responsible in my body and my soul for the fate reserved for my brother. Since then, I have understood that what he meant quite simply was the anti-Semite is inevitably a negrophobe." 2. 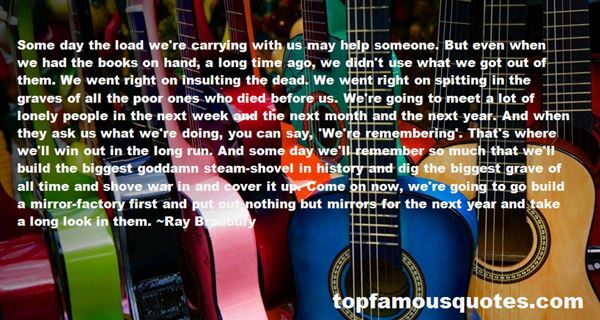 "Some day the load we're carrying with us may help someone. But even when we had the books on hand, a long time ago, we didn't use what we got out of them. We went right on insulting the dead. We went right on spitting in the graves of all the poor ones who died before us. We're going to meet a lot of lonely people in the next week and the next month and the next year. And when they ask us what we're doing, you can say, 'We're remembering'. That's where we'll win out in the long run. 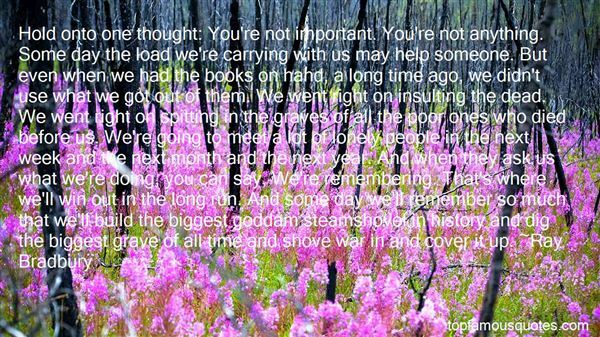 And some day we'll remember so much that we'll build the biggest goddamn steam-shovel in history and dig the biggest grave of all time and shove war in and cover it up. Come on now, we're going to go build a mirror-factory first and put out nothing but mirrors for the next year and take a long look in them." 3. "Hold onto one thought: You're not important. You're not anything. Some day the load we're carrying with us may help someone. But even when we had the books on hand, a long time ago, we didn't use what we got out of them. We went right on insulting the dead. We went right on spitting in the graves of all the poor ones who died before us. We're going to meet a lot of lonely people in the next week and the next month and the next year. And when they ask us what we're doing, you can say, We're remembering. That's where we'll win out in the long run. And some day we'll remember so much that we'll build the biggest goddam steamshovel in history and dig the biggest grave of all time and shove war in and cover it up." It was only my first AA meeting, but I was certain assaulting a fellow alcoholic wasn't one of those Twelve Steps."